*Regular nightly rate is $189. Weekly rate is stay for 7, pay for 6. Your reservation total will include a cleaning fee and bed tax in addition to the rental rate. 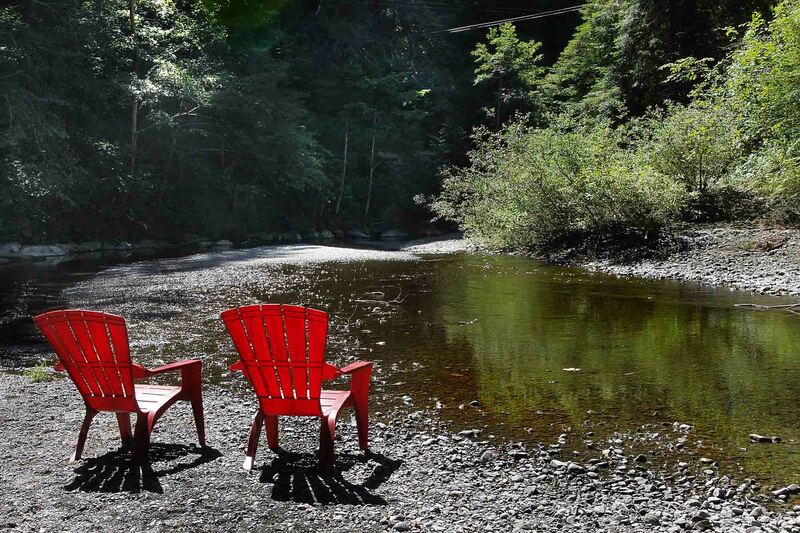 Romantic, Light-Filled Contemporary Creekside Cabin, Redwoods, Gas Fireplace, Hot Tub, Private Creek Access, Great Views, Sandy Beach; Short Drive to Coast, Wine Tasting, River Beaches, Golf. Wi-Fi; Unlimited Domestic Long Distance. Keyless Entry. Your Well-Behaved Dog is Welcome! The living room has a nook for dining and opens to a deck, outdoor dining and creek access. The kitchen is adjacent and open to the living room. The bedroom and bathroom are off the main living area. Off the bedroom, there's another deck with hot tub and dining set. Out the front door, to the side of the house (on the little traveled street, partially screened), there's a third deck with dining set and loungers. Please note that glider in deck photo has been removed. "Such a wonderful, peaceful place!" Such a wonderful, peaceful place! This exceeded our expectations. Clean, indoor/outdoor experience, responsive host, and the home and space had wonderful energy. We will definitely plan a return trip here! 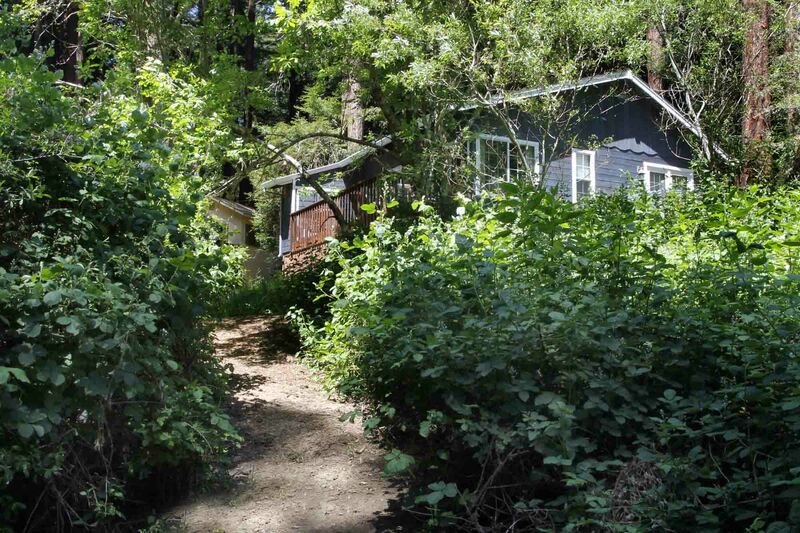 "The cabin is in a great location"
The cabin is in a great location, by the creek in the redwoods. The couch is not in great condition. If you go in the winter, recommend asking the owner to turn on the fireplace before your arrival. The fireplace is the only heating source and it can get pretty cold. Delightful and relaxing getaway. Exactly as described. We enjoyed the beautiful and peaceful setting. And brought our dog! "Beautiful home in a peaceful setting...perfect weekend getaway!" Beautiful home in a peaceful setting...perfect weekend getaway! "A truly warm, cozy, dog friendly unit!" A truly warm, cozy, dog friendly unit! We were not entirely dissatisfied! If the sofa is not replaced, you may not be terribly comfortable chilling in the one we had. Bring your own pillows if you need neck support while sleeping. And bring your own tissues if you have allergies (may be an oversight, but none in unit). Finally, and most importantly, we were locked out of our entry code one hour before our check out time! Please be careful as there is no cell phone coverage! Lovely cabin on Austin Creek. The quite stillness was only interrupted by the wind and babbling of the creek. Thanks! "This listing was very clean and comfortable"
This listing was very clean and comfortable- nice spot for a weekend getaway, very close to both wineries and the coast! "Couldn't have asked for a better stay!" This place was just as described inside - comfy, very clean, spacious kitchen, with a very nice gas fireplace, and totally magical outside! 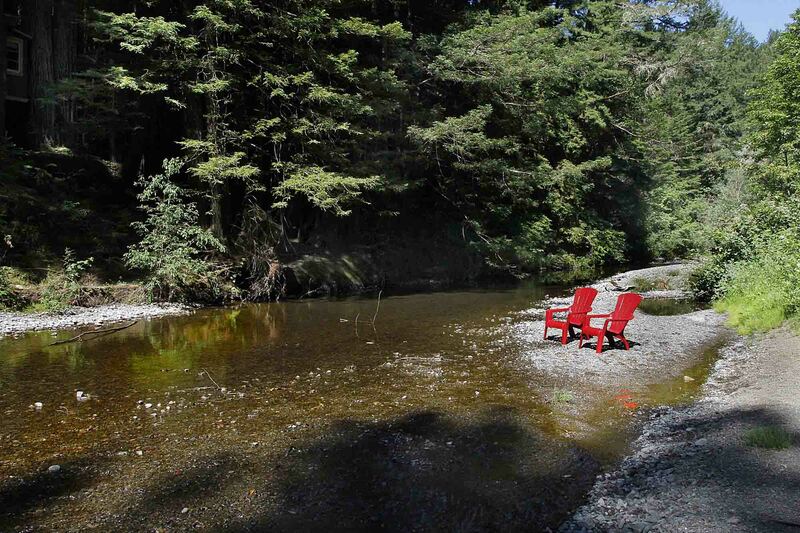 The hot tub was secluded and overlooking the creek and beautiful redwoods. The sheets were very soft and the bed very cozy. Couldn't have asked for a better stay! "Great property right on the creek"
Great property right on the creek! Easy check in and out, and the house was clean and cozy. Cloud 9 was divine. Amazing views and a lot of small town charm. Will definitely be back! "Great location! Loved the place. Highly recommend." Great location! Loved the place. Highly recommend. "a perfect couple’s getaway "
This little cabin in the woods is a perfect couple’s getaway from the city - especially if you have pups to bring along! The house was spotless, thoughtful touches abounded and the location was perfect! This place is simply a dream! Surrounded by the best nature, the smell of the trees, the sound of the creek, simply perfect. The house is very cozy, perfect place to relax. Close to the river and to the coast. Great amenities, everything that you might need to cook was available. Hot tub was the best! Had an amazing bday celebration. Awesome, cozy, romantic. There was nothing I wanted from this rental that I didn’t get! Amazing stay. What a fabulous cabin. We had the best stay. Highly recommended!!! We can't wait to come back. Great location, amazing view, and a relaxing atmosphere. Loved it! Me and my husband look forward to visiting again. I had the perfect getaway from the Bay Area with my husband and 6 month old daughter. I feel as though the photos of this cute little place don't do it justice! We were very impressed with the location, redwoods right out the front door and access to a creek from the back of the house. Sitting outside on the deck was lovely in the evening, everything was so peaceful. Even though there are other cabins very close by, we felt very much like we had the area to ourselves, I don't think we even saw another person. The cabin was lovely, I loved all the small touches like toys and pillows for dogs and the tubes and swim gear. The kitchen was fully stocked and we were able to cook anything we needed. We had an amazing stay and would definitely recommend! 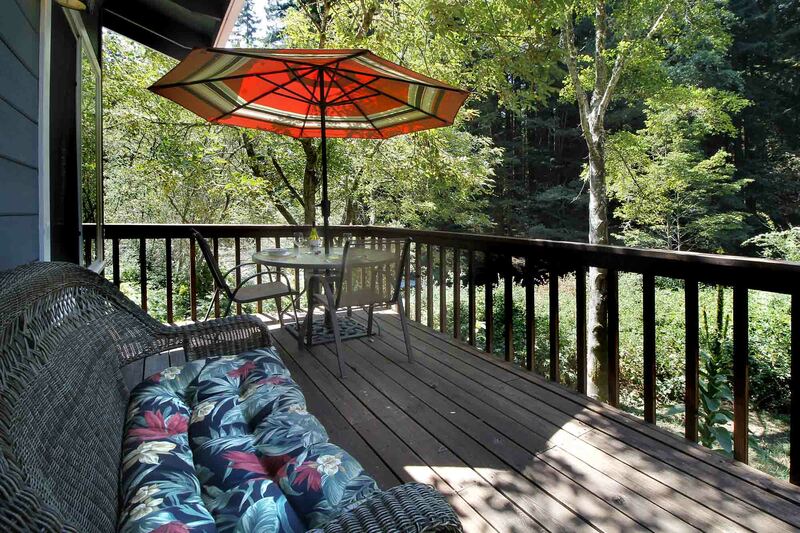 "The deck seating is comfortable and plentiful"
Como Estate is the ideal river location. It is directly on a quiet part of the river. The deck seating is comfortable and plentiful. There are several outdoor areas to relax in. Perfect spot to unplug! Between the babbling creek and the hot tub you can’t go wrong. Close enough to town to grab supplies and only 15 minutes to the beach. I needed a relaxing vacation and I got what I wanted the week I spent there. "Very quiet and peaceful location." Very quiet and peaceful location. Tons of ripe blackberries on the way down to the creek! However, the creek had very little water and lots of algae, so no swimming for us. The one car limit for parking made things difficult since my guest and I had to take separate cars due to work. (Looks like two cars would fit if you parked them well.) House has a smart TV but it doesn’t connect to the WiFi, so if you’re hoping for Netflix or Hulu, bring your own device. Overall, things were pretty clean and well stocked. Our stay was great! The pictures actually don't do it justice. The area was gorgeous, and the house was full of everything that we needed. "This is a wonderful large cabin"
This is a wonderful large cabin right next to Austin Creek. There is a nice balcony deck looking out over the creek to sit on during the afternoon and evening with the sun. Everything was well laid out and we enjoyed the space. "All in all a great stay, and wonderful location." This was a great getaway, very private and quiet. It was clean, well kept, and quaint, and delivered on all aspects of a romantic getaway. Manual instructions and a few snafoos on electronics in the house were confusing, but since our intention was to relatively disconnect, these were not big issues. Hot tub instructions could use some updates to make things more seamless. All in all a great stay, and wonderful location. "Lovely spot. You won't regret it!" Lovely spot. You won't regret it! Great place to get away and relax. Very peaceful and quiet. Great to enjoy morning coffee and afternoon coffee by the river. What a wonderful place, exactly as described. Great quiet getaway on the water in a fantastic area. The house had everything we needed. The kitchen is very well supplied with all we needed to cook and eat. The views are very nice and the area very well. We look forward to returning soon. Cozy space, creek access, hot tub was perfect after a long day out and about. It's not the most private, with homes directly across and next to you, but still quiet and peaceful. Enjoyed our stay. If we had our own rental cabin, it would probably look a lot like Cloud 9. The location was incredibly quiet and serene, and the house was very comfortable to relax in. We were hoping for a restful weekend away from the hectic pace of normal life, and absolutely got it! Thanks for all the amenities to be comfortable. Relaxing, beautiful views of stars from hot tub and felt like " a home away from home"
"Cloud 9 was the perfect Oasis for us"
Cloud 9 was the perfect Oasis for us. The home is super clean and cozy in a very private location. It was so nice and quiet, just what we needed. RRG is super nice and quick to respond to any questions we had. We look forward to our next visit! "Great little cabin for getting away"
Great little cabin for getting away. Very peaceful and quiet. Nice view of the creek out back, and huge redwoods all around. Loved the dog beds/toys/etc included at the place. Cloud 9 was amazing! Very private and peaceful. Shower was awesome too. The hot tub was perfectly located, but the jets seemed really weak even with attempts to adjust them. Overall, a great place to get away! "We can't wait to go again!" We spent a quiet weekend here with our dogs for our 10 year anniversary. Cloud 9 was the perfect choice! The house is very well appointed and has everything you need for a comfortable stay. The location is quiet and surrounded by redwoods. Our favorite activities were star gazing from the hot tub, taking the dogs for a walk by the creek and playing cribbage by the fire. We had made reservations on Saturday night for dinner but cancelled them so we could spend more time relaxing at the house! Some tips: bring water shoes if you want to walk along the creek. It has many twists and turns and although the water is shallow, you will have to get your feet wet to follow the creek along the shoreline. If you want to eat out, Dunan's Mills is close and has good choices. We ate at the Blue Heron for lunch and the food was excellent! Cape Fear Cafe looked like a great spot as well. The little town is very cute with some good shops. 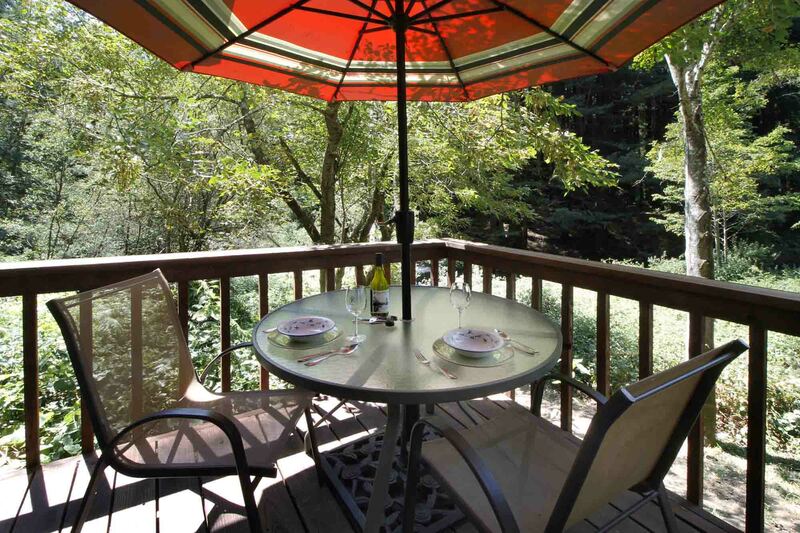 Guerneville is bigger with more choices and is a little farther. We are new to the area and didn't want to drive back and forth in the dark. We loved the house and the area. We can't wait to come back for longer so that we can do more exploring and relaxing. "We had a lovely stay in the woods"
We had a lovely stay in the woods. Hot tub right off the bedroom, hammock for napping, and creek side adventures just a few feet away. I also ate SO MANY blackberries from the backyard. Yum. We so enjoyed our weeklong vacation to this lovely area of Northern California. The accommodations were peaceful and plentiful! 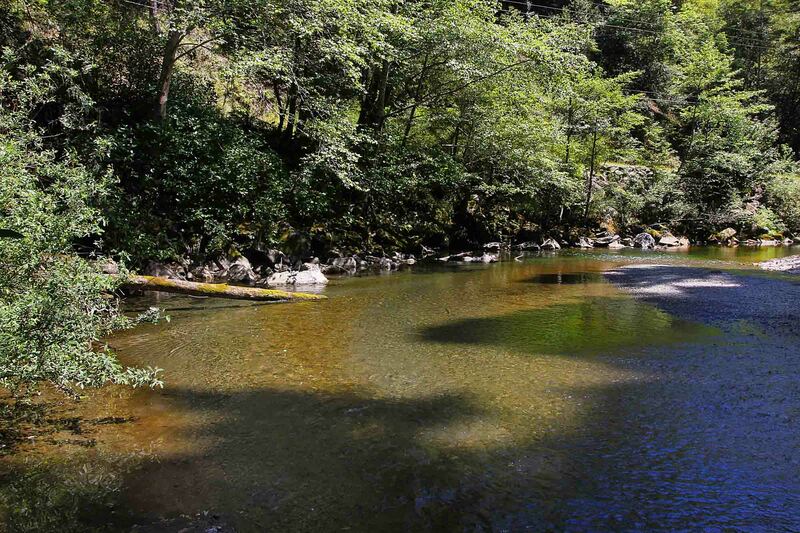 We were able to rest and relax in the beautiful redwood forest, sit alongside the creek while our dogs played in the river, visited the nearby towns for lovely dinners, and even checked out a few beaches along the coast. Cloud9 is a gem! "This cabin is off the beaten path"
This cabin is off the beaten path. Private and quiet. It is well appointed and perfect for 2 people. It's about 10(ish) miles from Guerneyville, 23(ish) miles from Bodega Bay. Very clean and we loved that we were able to take our pooches! Great getaway , home away from home. Everything you need is right there. We loved it. Had a great time. Place looked exactly the same as our last visit. Clean and charming. The only suggestion I can come up with is maybe replace the coffee maker with a faster model. Keurig? It took 20mins to brew a pot. Cant wait till our next visit in June. Oh yea we had to call the hot tub guy to come out and fix the control panel. Got it working for our last nite. It was such a great weekend to get away from the city. My wife and i got there, and it started to rain, and continued the entire weekend, but we found plenty to do in the house. Cooked lots of delicious meals, board games, art projects, and the hot tub was amazing. Bring some DVDs if you want to watch & enjoy movie night. Overall we had a wonderful time. My husband and I absolutely loved out long-weekend getaway at Could 9. The location on the creek was beautiful and secluded, but not too hard to access at all. The house was the perfect size for us and all the amenities were more than we could have asked for — the kitchen was a pleasure to cook in, with all the cooking equipment you could ask for, including really nice pots and pans, and even some basic spices, and sugar for my coffee. They have a fantastic collection of movies and board games, too. But most of all we loved the decks looking out over the creek and the hot tub!! Even tho there is a neighbor next door, there is 100% privacy. The gas fireplace was cozy and the couch and bed were both really comfy. Instructions were clear and we had no problems finding the place and getting settled. Communication leading up to our trip was also fantastic and friendly. We would especially be in love with the place if we had a dog — it's a very dog-friendly house in all the nicest ways. We wish we could've stayed one more day and I wouldn't be surprised if we go back again sometime. Tip: bring a couple extra towels and a sponge for doing dishes. 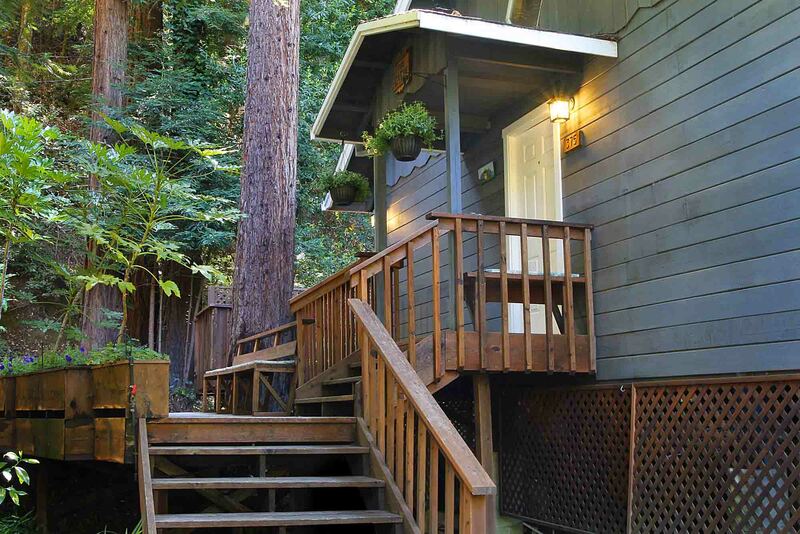 "Cloud 9 was the perfect getaway in the Redwoods and just minutes from the Sonoma Coast!" This was our 3rd time visiting the area and we truly enjoyed staying at Cloud 9. We love the area because of the pretty Redwoods and the beautiful Sonoma Coast. There's so much to do, good food, wineries, shopping and Hwy 1. They are very dog friendly and this was our Labradoodle Bailey's 2nd trip with us. I would definitely recommend staying here to anyone! "peace and quiet in the beautiful woods"
I went for 5 days with my 20 year old daughter. It was truly heavenly! The location iin the woods is gorgeous and serene. The house is adorable...kitchen has a good amount of dishes, utensils, cookware, and appliances. There is no dishwasher, but that wasn't a big problem for us. We ate in Duncan Mills a lot or brought food in. The bed was extremely comfortable. The hot tub was wonderful with an amazing view. Shower is huge. Only thing we missed being girls,was a full length mirror. The creek is very close and so is a swimming hole. Walking along there is one of my favorite things to do. Get a pair of water shoes, and you are all set. Absolute serenity! We watched movies (we brought some, but their is a good supply at the cabin too), we went to the bakery in Duncans Mills and the famous Raymond's. Their hours of operation vary and are very limited, so call first. We went at 11 on a day when they opened at 8 and they were almost out of everything. We liked the one in Duncans Mills. Lots of goodies! We loved the Caesar salad at the Blue Heron also. We traveled to Safari West one day, kayaked the Russian river, hiked from Shell Beach to the Pomo campground. We really loved every minute and wish we could go back already! "Our second stay at Cloud 9 was just as perfect as the first!" Once again we had a fantastic stay at Cloud 9. It was nice to go back to a place where we knew we were comfortable. It's clean, spacious and in the perfect location for relaxation! "Cloud 9 is a great get a way place." Very good stay. Creek was only 20 ft from cabin. almost flood stage. Great sitting in hot tub while constant downpour of 1 inch per hour rain storm all weekend. Could of needed more towels. only had 4 out and for a three nites stay and hot tubing, more towels were needed, had the laundry line going in the house to dry off the wet ones to use for after showering. Other than that all was great will stay again. We come back (4years now) ever year on the same weekend. I love the area, the house is so perfect for us. They spoil us with all the creature comforts of home and then Austin Creek and the great outdoors is right outside. I have troubles sleeping when I travel, but never when we come here. Clean, good wifi, lots to do (or not if you choose). The beach, cute little shops and lots of long walks by the creek. See you next year Cloud Nine! I forgot this place recently flooded due to heavy rains. The yard was covered in mud, which normally wouldn't bother me, but I had my two dogs with me. Trying to wipe their paws every time they went out made me cut my vacation short. Otherwise, I think the owners thought of everything to make our stay comfortable. Since you are far away from the stores, if you forget anything it's a long drive to pick it up. We used the gas grill to cook our dinners and if it wasn't so cold, we would have tried the hot tub. It's small and they only allow two people so it's not for families. We had a masseuse come over to the house, that was nice and management arranged that. I would have preferred being closer to the wineries and the mud was a disappointment. This is just my personal preference, the house itself was nice and well maintained. If you are planning on staying in this area, then this might be the place for you. Also in these types of rentals, there is a cleaning charge but you have to clean up prior to leaving, emptying the rubbish, putting towels in the wash, and cleaning all your dishes (we didn't have a dishwasher). "All the comforts of Home and More..."
Perfect spot for a couple to have a respite from hectic life. All the amenities, quiet and comfortable. Loved the hot tub! Convenient to coastal, backroad and redwood sightseeing and wineries. Very easy to make reservation and no hassles whatsoever. Would definitely go again, perhaps with dog next time. Creek was very low, but still picturesque. We walked in to a relaxing environment. The kitchen was fully stocked with plenty of counter space. Living and dining were cozy. Bed was comfortable. Loved the three outside decks with views of the Forest.The cabin is away from the busy areas on a quiet road. Jacuzzi was perfect for star gazing. The trail to the creek was easily accessible. The only draw back was that the creek was dry for the most part. The Cabin was close enough to visit Duncan Mills, Monte Rio and the Beach. We enjoyed taking our dogs. They were in heaven. The only suggestion would be to place lattice behind the flower boxes. When you walk out the front door you see the other house. We would visit again. "bright sunny spot in the woods!" Beautifully located cabin in the woods not far from a town with all amenities. Unfortunately, some construction was being done across the creek and due to its canyon effect, quite noisy! This motivated us to venture out to the coast and the wine country during the day. However, we could still appreciate the quiet and peaceful atmosphere once the crew left. Only one little thing that needs updating: an aged noisy hot tub with chlorine! My husband, my 3 year old daughter and I recently stayed at Cloud 9, for one week, and could not ask for any nicer accommodation. It was clean, well furnished (everything we needed, even ketchup!) and cozy. The view from the deck(s) was amazing- grand redwoods towering in all directions- amazing. The creek is about 50 steps away, with a huge swimming hole just around the bend (easy walk along the creek) the road is very quiet. The only neighbors are to the right of the house (if facing) and across the creek- both were very quiet. We have fond memories of our Caz vacation- and Cloud 9 helped make it happen! It was a blessing to stay there! "Cloud 9 or Closest thing To It!" Talk about Perfection! 15 minutes from Guernevilleand You R a World away. Cute well kept home, everythingIn Good Standing order located in Creekside. Twins spent timeLooking for Crawdads (found em), walking downstream to the Fork in the Creek to Spin the Log, blowing Purple bubbles (yes Purple),watching the Night from the hot tub while Fathom ourHusky/Wolf mix enjoyed time on the deck protecting The BBQ. Tell ya we wanna go back already and weHave just been home over a week. Young, Old, Couple or SingleThis is were it is at! "a place you need to be to get away from it all"
It was our dog Dudley's first getaway with us and what a great time we had. The house had everything we needed and the surrounding made us feel as though it was meant for just us. How serene and beautiful. The people I spoke to were polite and courteous. I'd recommend this place for any couple with a dog, and if you don't have a dog it will be just as blissful. Thanks RRG! We enjoyed our stay very much! Just so other people know the beach is shared by the next door neighbors they have their own access but if you both have dogs they will notice each other and this was kinda a pain for us because my does wanted to go check out the other dogs! And I really didn't want to deal with that not knowing how they would all get along. So we went back up to the house when they came down. The house is great! Has everything! It does get hot especially the front room when the afternoon sun comes in. They do have two fans and a ceiling so that helps. The sliding screen door falls off or gets stuck almost every time we used it which was a lot because we enjoyed sitting on that deck over looking the creek. The Internet stopped working that was somewhat annoying. I unplugged and plugged it back in and that got it back working. They should give you some advice on how to get the wifi back up. Because after reading another review I think this maybe an on going issue. There was a a lot of wasp activity on the deck and I noticed some hives so I hope they check into that. I also noticed them going into the washer dryer area so they may have a hive in there as well or building one. And then last the French doors in the bedroom drove us nuts one night we could not get the doors to lock to the door frame, we could lock them together but then you could just push them open. We stilled enjoyed our mini vacation. But sometimes when your dealing with some of these mishaps it reminds you of being at home. I emailed the russian river getaways vacation planner so they could alert the owner of these issues.They never got back to me, so hopefully they did fix the problems. We are a very dog friendly area here on the Russian River, it's what sets us apart from so many other areas. I myself have never had problems with other dogs. Perhaps next time we can find you a cabin with a fenced yard so you don't have to worry about your dogs. We have several that would accommodate you. We have repaired the screen door and took care of the wasp/bee situation at Cloud 9. Being out in the forest we do run into many creatures and appreciate you alerting us to their presence. The door leading out to the hot tub from the bedroom is a mystery to us. One side is locked at all times and has never been opened until recently and we don't know how it happened. We have fixed the problem and hopefully it won't happen again. My partner and I fell in love with this location. We have been to the wine country many times and have rented other locations. Cloud 9 is the only place we want to return to for another stay. It may be a bit remote for those who don't care to drive, but it is well worth it! We felt completely at home the entire time. The kitchen was perfect for us and we cooked several great meals there. We will definitely be back if availability meets our schedule this fall! Cloud 9's location is definitely ideal for a getaway. It's only 20 minutes to the ocean and 30 minutes to Guerneville and so private with your own little piece of Austin Creek. We'll see you again this fall! "Off the beaten path, quiet, and just great"
If you are looking for a quiet "cabin" this is the right place. Very quiet location on a "creek" (we came during the rainy season, so the "creek" was more "river" at that time). Small-ish sandy beach right in the back yard, 3 decks, well-kept interior with reasonably-well-appointed kitchen, good supply of games and books along with a few DVD movies, TV (didn't use it), and WiFi. The cabin is in the woods with about 20 or so other cabins tucked in along the road which is very quiet and a good place to walk. There is one neighbor, but it is very private nonetheless. Lots of areas around to explore, and a few places to access the "creek". There is a general store about 5 miles away, and a full grocery store in Guernville (10 miles or so). This is not a complaint, but be aware that there is no cell service - but there is WiFi and a house phone. If you are looking for a quiet getaway "in the woods" with your significant other and your dogs that isn't far from the bay area, this may be for you. Lovely cabin with a beautiful views of the river. My husband and I spent 3 nights in total bliss. We hardly left, relaxed ate great food and had some fun. Everything we needed was there. The cottage is well equipped and clean. The wife and I stayed Oct 26-28; Cloud 9 was more than what we expected. The attention to details was truly awesome, it felt like being at a upscale resort. We have stayed at other places in the area, but this was by far the best and we will return,but only to Cloud 9. This property far exceeded our expectations! The photos, although beautiful, do not do justice to the spectacular views and all of the little thoughtful touches the owners put into this property. My husband and I will definitely return to this property next year and plan to stay longer! My boyfriend and I drove up here for our anniversary. We had a wonderful experience at Cloud 9! It was very well equipped with kitchenware, spices, and things to entertain us, as well as our dogs :) Our dogs had a fabulous time swimming in the creek, which was directly in the back of the house, so there was no need to take a far hike, which we had to do last year at another home. The only thing that I would complain about is that there were a couple of dirty dishes left in the oven, and for some reason the wifi would stop working after 10 pm on both nights, but that didn't make our experience any less worth it. Overall, this place was very clean!!! Thanks again for having us! So glad you enjoyed Cloud 9! We went up there for a short weekend get away, and when Sunday came around, we wanted to stay so badly. I felt at home, comfortable, and we got a lot of rest in a short amount of time. My dogs thought they had gone to heaven. I was very pleased to have my dogs experiencing the woods with us. We will be back. Had a delightful Labor Day weekend. The house was comfortable, with all amenities in great working order. The area was quiet and nice, bugs were minimal. The creek was running out back (our toddler loved wading and playing on the rocks), and there were lots of sweet blackberries on the bushes. Great spot! We loved Cloud 9! After 15 years of marriage and parenting three kids, we finally had a 'mini-moon'. It was amazing: the view, the house, the hot tub...Our only issue was that the price was a bit steep for just two nights, considering I had to wash the bath robes and found strong language against leaving any dishes... We will splurge again though, it was well worth it! Cloud 9 was the perfect get away for us and our two small dogs. We started our stay off with in home massages, a recommendation by Russian River Get aways. Very cozy cottage with its own private beach. Great neighborhood for walks and runs. Have already recommended Cloud 9 to friends. This place is magical!!! We had a blast with our three dogs and a it's a very romantic place as well. Sunny days and stary nights, so nice!!! The creek was very clean and our dogs loved it!!! The swim hole just steps from the house was our favorite spot to have a swimn first things in the morning. Just a few things we would like to recomend the owner to consider adding to Cloud 9...we didn't want wast a second of our vacation washing dishes, so a dishwasher would be very handy. A screen door on the bedroon door to the balcony would be very nice so we could sleep with the balcony door open on a warm night and hear the creek soothing sound from the bed without worrieng about bugs. The pathway to the creek was so crowded with blackberies bushes that it could be trimmed down a lot and still look rustic but safer to walk without hurting yourself or the dogs pawns with all the thorns from the plants (like we all did). Also we didn't find recycling garbage bin and we didn't feel good about it considering the place have nature all around it, but we reclycled anyway. Overall was a very special place and we are coming back in august for our anniversary. If these little adjustments could be arranged fefore our return it would be a very nice surprise for us. We all recommend this place!!! Everything I expected and then some...very quiet and peaceful, cute and clean cabin, everything the site promised. "Quiet, comfortable, lovely place to relax." We had a lovely time, relaxed, read, walked the dogs in the redwoods. It was a very quiet time of the year, so we had a very nice quiet vacation. Everything about Cloud 9 was as advertised...nice location, great light, quiet, well-stocked kitchen, etc.Spent two wonderful nights here with the wife and will surely return. A couple of things that made the whole experience only 'Very Good' as opposed to 'Awesome'...1)the dishes and glassware were dirty. Crusted chunks of sauce on the bowls/plates/cups. Even though you pay a $80 cleaning fee, guests are supposed to clean their own dishes and whoever was there before us did a poor job so we had to clean our dishes and glasses before using them too. 2) Hot tub could have been hotter. It was set to 99 (instead of the 102-104 in the literature). But the babbling creek and feel of escape from the city made it all worthwhile. Were so glad these guests enjoyed their stay, and were sorry for the issues they encountered. We do strive to make our homes as clean and welcoming as possible. The dishes and the hot tub were both previous guest error, but we regret that we didnt catch and correct before these guests arrived. We ask guests to do their own dishes because the cleaners mostly dont have time to do dishes and clean thoroughly in the time allotted between many bookings. Most of the time, people do a good job, but there is the occasional misfire. I thought I will get depressed in the midst of the redwoods...but this location and the house rejuvinated me and my Husband like nothing else. I just love this place and plan to come back soon. I love the swing. Only down side is that gurneville is 20 mins away that was just my concern since I was travelling with an 18 month old who tends to get hurt very easily and the nearest medical center is in gurneville. But thankfully everything around is just too safe . I love this place cloud 9. That is how it made us feel like on cloud 9 !! I took my sweetie to Cloud Nine on a getaway weekend to celebrate our first anniversary. It was perfect for the occasion - very quiet, peaceful environment, gorgeous views from every room and the constant soothing sound of the creek in the background. The porch swing was great and the hot tub amazing -- take a long soak and look up at tons of stars in the night sky. It was too cold for swimming in the creek, but there was a very inviting spot just downstream...we'll keep it in mind for next time.Oh, and our dog was postively over the moon with happiness. She swam to exhaustion and wants to go back asap :). This is the third time we have stayed at Cloud 9, and the tenth stay with Russian River Getaways. Cloud 9 is perfect, being on Austin Creek, with the forest all around. Our dog loved it, and it is relaxing and tranquil. We had a wonderful stay at cloud 9. The house was very comfortable and had everything we needed. Location on the creek was great. The dogs had a blast playing in the water.Thank you for a wonderful weekend! "Cloud 9 is a fantastic getaway." I was looking for a quite getaway from my busy life in the South SF Bay and this house delivered for me and my girlfriend. Cloud 9 is a very well maintained cabin right next to a beautiful creed. With 3 decks, BBQ, well stocked kitchen (pots and pans not food) and a hottub you have everything you need for a great getaway.We had an issue where the hot tub was not heated properly and it did not get fixed during our stay, but the management company was kind enough to refund us some of our $$ for the inconvenience which was good of them. I've used RR getaways before and they are usually very on this so I'll chalk it up to a one time fluke as I will definitely call them again when I need a local vacation and some quite time to enjoy some fresh air in a beautiful location. "a little slice of heaven, with some old testament overtones"
We have stayed at Cloud 9 three times now, and have really enjoyed each stay. The house is so, so clean and neat and the kitchen well-stocked, the views are gorgeous, and the hot tub is the perfect temperature. We will back again soon, I'm sure. However, one feature was a bit different this time. While in previous visits, our experience felt very private, on this trip we got several knocks at the door, which really disturbed the mood that we felt we were paying for.Because there was a downpour that weekend, the hot tub lid was saturated and weighed many times its normal weight. So at one point, we got out of the hot tub and went back in to get dressed before struggling to get it on. Soon there was a rap at the door -- the hot tub maintenance person knocking to say he just happened to be driving by and saw the lid off and wanted us to know that leaving the lid off is bad for the electrical system. Next, even though we had gotten a special deal for late check-out as returning customers, during our last hour when we were having a cozy, quiet moment on the porch swing, there was another knock at the door. This time it was the cleaning staff. No one had told her we had a late check-out.She left and said she'd come back later, and we cozied up again, but moments later, there was another knock on the door. The hot tub guy again -- wondering why we were still there. He hadn't been told about our late check-out either.What was disturbing about all the visits wasn't that the staff weren't nice -- they were! -- it was just that we imagine ourselves having a very secluded, private time. It's a little weird to know that we are being watched in the hot tub, you know? Next time, I think we'll wonder if every passing car or truck is the owner, property manager, hot tub guy, or someone else checking up on us. We scheduled this vacation in the midst of overtime hours and very long days at work. We needed something to look forward to! So the thought of getting away for a few nights was the light at the end of the tunnel.When the time finally arrived, we couldn';t have been more satisfied with our choice. The location on the creek was entirely peaceful and the home was very comfortable. A perfect size for two!We enjoyed cooking in the kitchen and using the grill, sitting on the porch swing and listening to the birds, walking along the creek and absorbing the peace of nature, and relaxing in the hot tub.We found everything we needed there and appreciated the wireless internet (though we used it only minimally) and the free long-distance as our cell phones were out of range.We'd recommend the place to anyone looking for some quiet time away from it all. We will definitely visit again! We stayed at Cloud 9 for one week. The house was super cute and cozy. Also very clean. We brought our Doxy along and they had 3 dog beds at the house to use, although we brought two of our own! LOVED the porch swing on the deck facing the creek. Very private setting - great place to unwind. The creek did not have as much water as we expected but it was still nice. It rained our second day but we didn't care, although it put a damper on the Blues Festival that was going on in Guernville. The only problem we had was that the VCR was broken (we didn't really care) and the smoke alarm battery was dying and kept bleeping one night, but they came out to the house very quickly after we called them in the morning. All in all a cozy, nice place to relax and unwind. The kitchen had everything you need, the bed was comfy, and having internet access was a plus. Also enjoyed their collection of magazines and books. What to say?It was one of the most relaxing Vacations we had in a long time .Area around Russian River is amazing.Cabin we rented for a Week is great place to spend relaxing vacation ...That can Include great hiking,Kayaking .....super tasty Coffee and Cookies in local Bakeries .You have to go and see for your self. Hey folks this is Happy and Buddy and we're of the four paw variety. We LOVE it at Cloud 9. As much as we love bones this treat was even more special bcs we got our human back. Our family has lost some loved ones this year and our "mom" had stopped laughing and with all the sad details involved she stopped playing with us. Well while here at Cloud 9 on the first day while hiking and swimming in the creek we heard a sound that got our tails wagging like nothing else could. Our "mom" was laughing again. Even better,she laughed the whole time we were there and we had so much fun we STAYED AN EXTRA NIGHT. She played with us again and with no distractions- it was WONDERFUL! The water was deep enough for us to have a BLAST and in some spots deep enough for even our "mom" to swim in. We walked for hours and spent our relaxation on the wonderful porch while she basked in the moon light and hot tub. Our souls feel as cleansed as that beautiful clear water and at Cloud 9 the water makes a babbling brook sound that is soo peaceful we didn't have a desire to watch tv. "Mom" loved reading her Bible next to the waters edge and watching the sun come up. We sure worked up our appetites and that kitchen is fantastic! Lots of thoughtful extras. "Mom" met the owner who she says is a very nice man, nicer than the staff at R.R.G's. Please watch out for the timer locking you out early as it did us, thank God we were all together and had our keys or we would have been in a big mess. It locked us out electronicaly a half hour early,and R.R.G's attitude was "Oh well!" The owner's kindness more than made up for it and bcs of him we will be back. It is very rare to find a porch swing in such a GORGEOUS setting and that was one of our favorite parts! Our loved ones are in Heaven and now thanks to Cloud 9 we get a little bit of heaven too. Most definatley a full 5 paws from all of us! PS it was so good our mom is still happy and our play continues. Thank you Jesus and Cloud 9! We're thrilled with this feedback as this cabin is truly magical. Just a comment on the keyless entry problem. We've been struggling with this issue of early lock-out and we have determined that it is a problem with the programming not taking into account our daylight savings time. Our services manager is working with the keyless entry company to see how we can resolve this. Believe me, we are far from indifferent to this issue;we just don't have a solution yet. I'm sorry one of our staff gave you that impression. I love Cloud 9. My husband and I stayed in Cloud 9 in November of 2007 on our honeymoon. I brought him back in March 2009 to celebrate his birthday. We had a wonderful time sitting in the hot tub, under the beautiful stars, listening to the creek. March was a wonderful time as it had been raining and the creek had quite a bit of water in it. The sound was amazing. It was lovely to stay in Cloud 9 as there is a great, stocked kitchen. We stayed in two nights and bbq'd which was great. I also was able to take my husband to one of the amazing, fine restaurants in the area. There are so many to choose from!! !We had an amazing time and I am hoping to return soon. "Perfect place to fall in love..."
I took my girlfriend away for a valentines week. The cabin was perfect for us two and the dog...The Hot Tub was wonderful to sit in at night, we could hear the river rushing past us while we were surrounded by the beautiful Redwoods..There was lots to do during the day in the russian river area, but it was far enough away from everything that it felt like we had the whole world to ourselves...Thank you for a wonderful stay. What a wonderful spot!